I'll take a leaf from Mark and invite people to submit answers to the joke. Winner gets a postcard from Sharon. 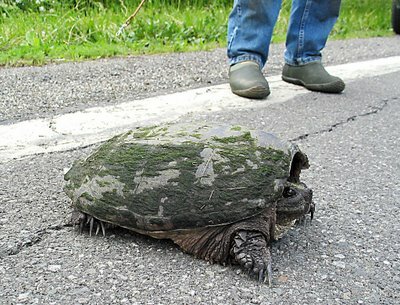 Snapping turtles are laying eggs this time of year, and for some reason often feel compelled to cross busy roads to find a nice spot. We're told we can just pick them up, move them to the other side (in the direction they were traveling - don't put them back where they started or they'll just go again.) I tried to pick this guy up but he started wiggling and thrashing so much I didn't have the courage to take him all the way, even though I knew he couldn't hurt me. "Dam it; I knew I should have changed my camouflage from kaki to tarmac grey"!! Just because she has green boots she thinks she one of us. Wait till I get my teeth into those boots, that'll show them to leave me alone. 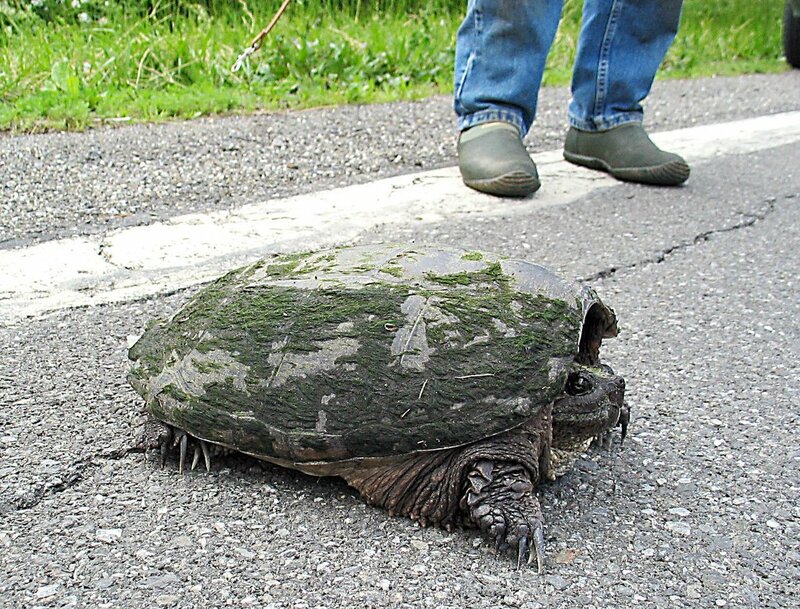 "Why did the turtle cross the road?" "what?! I'm going to DP hall of funny caption? Damn, I should've put on my best shell!" The turtle is thinking "Where is a boy scout when you need one?" "The grass is always greener on the other side..." ;). Wow, it must have been quite old with all the moss in its back. "Because its a shorter path to cross the road rather then walk on the road"
"If I keep moving, maybe I won't gather any more moss." TO take a bite out of your hide! Because Jenny wouldn't do it for him. oh myyyy - I wonder how heavy this thing is? We have ocean turtles (Honu) but to see a land faring creature is awesome! Becuse his wife MURTLE was on the other side! wow! nice new look ..did u design it? Thanks for the great entries - see today (Monday's) post for the winner. Kris, yes, I did do it - I was inspired by Wilf's blog (Realdailyphoto.) It took a few tries to get it right and I'm sure I'll keep tinkering with it. What a grand old turtle. You were privileged to see this one.